Sofia, 1925. Milos suffers an unfortunate mustard-gas relapse and returns to the hotel, whilst Violet becomes increasingly reliant on her all-too-regular morphine doses. Whilst the other (relatively) healthy members of the party visit the library, Violet keeps her cravings at bay by shopping for hats. The Colonel, prompted by his visions and certain discoveries at the library, suggests a trip to the local caves, and is frustrated when his suggestion is not received enthusiastically by the younger party members. Whilst the rest of the group return to the Moulin de Violet, Colonel Goodenough persuades a local boatman to take him up the river where he happens upon a scene of terrible carnage, and recovers something that he thought was lost for good. He fails to find the object of his quest, however, and rejoins the rest of the party at the hotel. Later that evening, Mrs. Sunderland also unexpectedly recovers something long-lost, as an old friend steps out of the past and into her bedroom. The evening's surprises are not yet exhausted, however, as in an adjoining room Violet gains a new perspective on her recent misfortune, and in still another room Grace embraces her newly-acquired sorcerous power. The following morning, a woman no-one has laid eyes on before enters the Moulin de Violet with a recommendation from Milos, and thus Mary Dawson joins the party as Mrs. Sunderland's new PA. She immediately ingratiates herself by skilfully (if mysteriously) making a cup of tea just the way Mrs. Sunderland likes it. The reinvigorated party follow the Colonel's lead to the mysterious cave he discovered the previous evening. Whilst the rest of the party discuss porridge, Col. Goodenough re-enters the cave, but discovers nothing more. Our heroes, minus one member, accompany Aktar on a stealthy trip into the Shunned Mosque. Aktar has time to regret his choice of companions on a short trip in a rowing boat. Within the bowels of the Mosque, Mary further hones her skills with a sub-machine gun, whilst the Colonel displays the somewhat surprising ninja prowess of a one-eyed geriatric with a gammy leg. After a brief perusal of mysterious potions, the group are soon cunningly disguised amongst many cultists, and are once more betrayed and captured. Our heroes witness the return of Makryat and the loss of the Simulacrum before they are re-united with a more-or-less complete old friend, and a much-less-complete even older one. Despite Max's best efforts, our heroes are subjected to a long monologue as Makryat gloats at them in their cell, and they learn something of the dreadful fate that awaits them. We also learn something of the Professor's taste in women (blue veined, mature, with a waxy coating). The episode starts in a familiar fashion – the party are graverobbing. They encounter the insane Companion of the Dead, who soon learns to regret sneaking up on the Colonel. Within the grave of Garaznet our heroes discover a shocking sight, and soon find themselves betrayed, and held captive in a most unpleasant fashion by the Brothers of the Skin. In a fit of panic, Mrs. Sunderland reveals all. Help comes from an unexpected quarter, and the party flee to the Bosphorus, where they suffer a delayed reaction to the horrors they have just experienced. Mrs. Sunderland shows her true feelings towards an old friend, whom no one else can see, whilst Mary Dawson becomes extremely tongue-tied. The now-rather-unstable group encounter Aktar, who has seen first-hand the terrible truth of the Brothers of the Skin, and agrees to help them enter the Shunned Mosque. After dinner, the party actually decide to follow up on a side-plot, though there is a brief pause whilst a broken Helen repairs herself. Max and Mary head to the library together to investigate "Garaznet: the thief" amongst the narrow and cozy stacks, whilst the other members of the group pay a visit to Sir Douglas Rutherford, the British ambassador, and learn of the disappearance of his son, James. The staff of the embassy are gathered in the garden for questioning, and shocking events follow (the Colonel's seen worse in the war, mind you!). Following a suggestion from the ambassador, the group decide to head to the baths to meet with the unfortunately (though accurately) named Beylab the Perspirer. The meeting is informative but soon takes a horrific turn and our heroes make a rapid exit from the bath house (some without even wearing towels!). We also enjoy discussion of the excellence of German tentacles, and learn why Paul now wields ultimate authoritaaah as a Keeper. Discussions include the love glove, and the best way to conceal weaponry in a bath house. Mary reveals her secret to Milos, who secures her new official papers with some well-judged words, and lots of money. Violet goes shopping for drugs. The party discusses what to do with the portions of the simulacrum, and a decision is reached. Re-boarding the Orient Express, the group head towards their final destination: Constantinople. They are not fated to reach it without incident, however. Whilst renewing their acquaintance with the good Dr. Gaspari over an evening meal, tragedy strikes. A terrible battle follows leading to an unskilled but effective use of a machine gun. Mrs. Sunderland is forced to perform an unpleasant task. The party barricade themselves within Mrs. Sunderland's cabin, unfortunately leaving some passengers to meet their end at the hands of their frightful nemesis. Mrs. Sunderland reveals some of her recent activities, and calls on the help of a powerful ally, to no avail. An idea by the Colonel and herbal delivery lead to a sanity-shaking melee in the corridor. 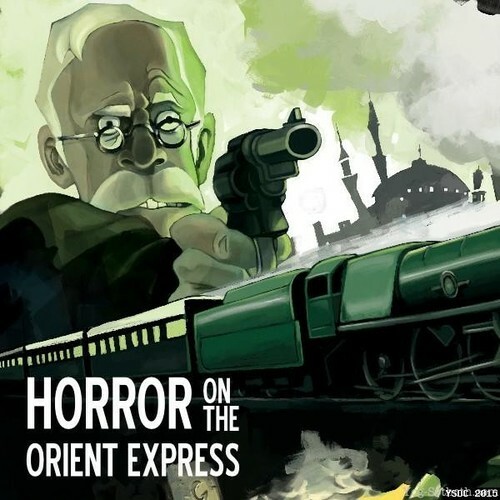 Investigators from YSDC's version of the Horror on the Orient Express campaign.